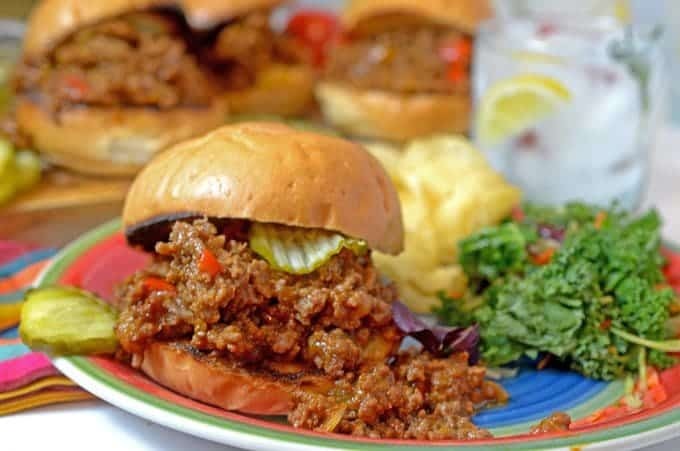 This Homemade Sloppy Joes recipe is better than any package of sloppy joe mix and you’ll even have a few bucks leftover for dessert. As a bonus, this is another one-pot wonder that makes clean up easier and faster. Win. Win. Win. Homemade Sloppy Joes are better than any sloppy Joe mix! I don’t know of many kids who don’t like a good helping of Sloppy Joe, or, if you prefer, Sloppy Joes. Singular or plural, it’s the same delicious meal when it comes to making this Homemade Sloppy Joes recipe. Legend has it that the sloppy joe sandwich as we know it has it origins in Sioux City, Iowa. It seems there that back in the 1930’s, a local cook named Joe came up with the template of this taste of Americana with his tomato-based “loose meet” sandwich. Talk about humble beginnings. Surely Joe had no idea that his kitchen creation would be destined to become ubiquitous with classic American cuisine. Interestingly enough, in America’s heartland of Wisconsin, Sloppy Joes are often referred to as Spanish hamburger. This fact was made known to me tonight and after asking a couple of cheesehead friends, I was told that this indeed the case. Coming off the recent flavor high that was provided by our Simple Goulash Recipe just a few days ago, I was generous with the amount of onions that I added to this one pot wonder. I have had sloppy Joes, made from a seasoning packet, numerous times. There is no comparison, in taste or flavor, of those processed envelopes of seasoning and this made from scratch Easy Sloppy Joes Recipe. We served these beauties with slices of Provolone cheese, bread and butter pickles, and chips and salad. Give this simple and flavorful recipe a try. You won ‘t believe how delicious it is to enjoy! A delicious, made from scratch version of a true taste of Americana. 6 hamburgr buns toasted lightly in oven. In a large skillet over medium heat, sautée onions and stir until wilted and light brown, about 5 minutes. Add diced pepper and garlic and continue to saute until pepper is softened. Add the ground beef and brown, drain off liquid from pain. Stir in the mustard, garlic powder, brown sugar and ketchup, mix thoroughly. Reduce heat, and then simmer for 30 or until ready to serve. Butter the hamburger buns and place under oven broiler for 2 minutes, just before serving. Can you believe it but I’ve never actually tri d sloppy joes! But they look so cozy and satisfying! I can just imagine eating them on a patio during summer! I adore sloppy Joes and have one coming up on the blog, my dad always waxed poetic about the ones my grandmother made during the depression! 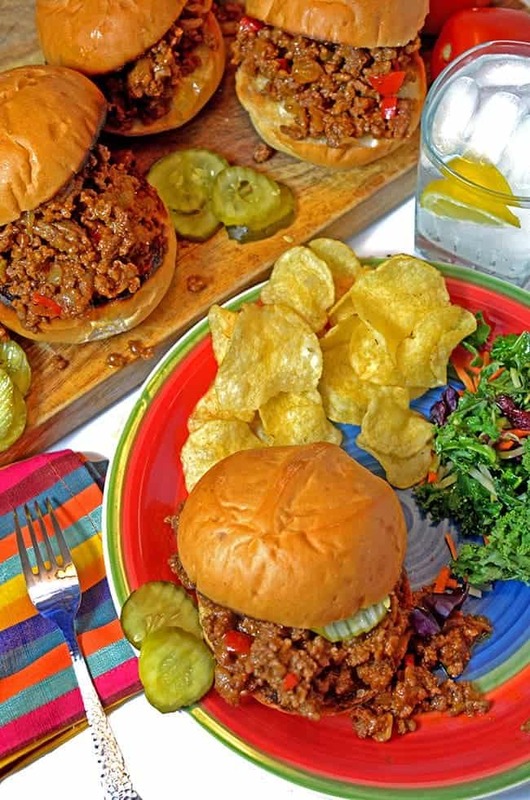 Believe it or not…I’ve actually never had a sloppy joe (shameful, I know) I never knew these were called spanish hamburgers so you weren’t the only one who hadn’t heard that! You make it look so simple I feel like I have to try making them now! Too funny, Fiona! I hope you try these soon, you won’t ever forget how great they taste! Nothing says summer like sloppy joes! My family would love these! Never tried Sloppy Joes but seeing that it’s a trademark dish going back to 1930’s, I would love to give a go! We love Sloppy Joes sandwiches. We grew up eating them and this reminds us of our childhood. Love the sweet bell peppers added in them. Great recipe – thanks! These look absolutely YUM. Saving this recipe, my family will relish these. I really would like some of this right now. I find Sloppy Joes delicious and just reminds me of birthday parties and guests. I think I will need to try your recipe! I was interested to read the history of Sloppy Joes. I had them first at a friend’s house whose Mom called them ‘Sloppy Sams’ as my Dad’s name was Joe! Your recipe sounds delicious – so much nicer than a packet! I haven’t had sloppy joes in ages, but I always love to add shredded carrots or zucchini – you can’t even taste them, and a great way to get some extra veggies. Delicious! Yum! Such a wonderful comfort meal. I bet it would be a huge hit with my kids. I love that you included a bit of the history. I’ve never made my own sloppy joes, I really should. Yours look delicious. I love to make sloppy joes for a group. This recipe has a few things in it that mine doesn’t. I’m just wondering how much brown sugar to add? It doesn’t say in the ingredients list. Phyllis, use 1/4 cup of brown sugar for this recipe. Thanks for pointing out this omission, which we have corrected. My mom used to make sloppy joes when I was a kid– but I am certain I have never made them as an adult! Oh wow, my kids would absolutely LOVE this recipe! I need to make it for them soon! That looks yummy! Perfect for Sunday afternoon at the pool with some beers or fruity Caribbean cocktails! I haven’t had a good sloppy joe in ages. It was interesting hearing where they originated. This is such a great hearty family friendly meal and yours looks amazing. I have not had sloppy joe ever! and your recipe is making me try one! I will try soon Thanks! Thanks for the backstory! I had no idea they were named for a supposed cook! I love sloppy joes! These look amazing, and I love the addition of the bell pepper. Yummy! I have heard of sloppy joes but I didn’t have a chance to try it yet. Your looks so delicious I am drooling. Will save it for the special day to come. 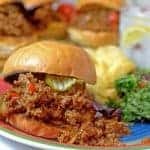 Helene, I think you will really enjoy this sloppy Joe recipe! I have never eaten sloppy joes so I like the little story behind sloppy joes as well as some info about the ingredients. Thanks for the comments, Julia. We hope you give these a try soon! 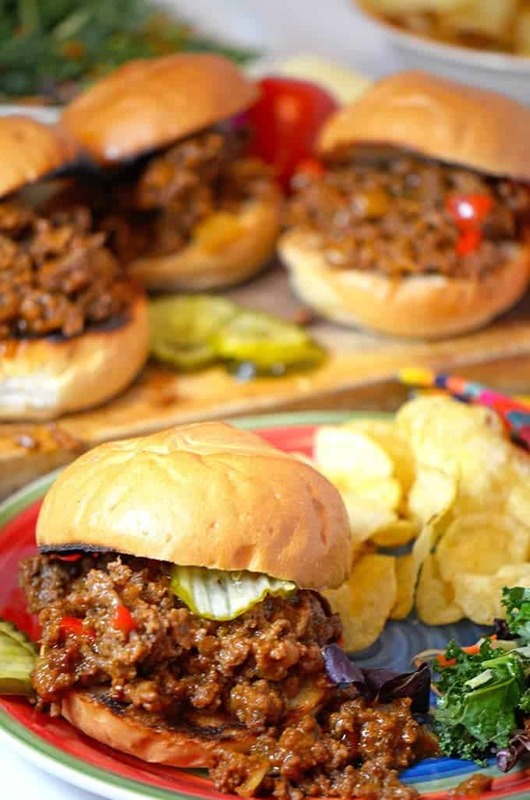 I have not had sloppy joes in a long, long time but these look fantastic! I’m realizing that my son has probably never had one either and that’s just wrong. I’m going to make these this week. Great post! It is just wrong! I hope you make it right and soon! Sloppy joes from scratch for the win!! I haven’t had one of these in FOREVER! Renee, I just know you’re going to enjoy this recipe! I seriously can’t remember the last time I made sloppy joes and now I’m wondering why that is. I know my family loves them — so shame on me! It’s easy to forget how wonderful simple can taste – this recipe is a great reminder. I hope you try these soon!